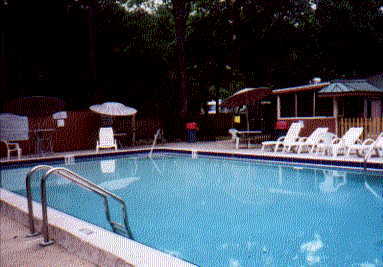 Manatee Hammock Park Campground is located right across the bay from the Kennedy Space Center. It's just as close as you can get to watch the Space Shuttle lift off. Unfortunately, the shuttle lift-off was postponed while I was there. But I got to take the 3 hr. bus tour around the center. 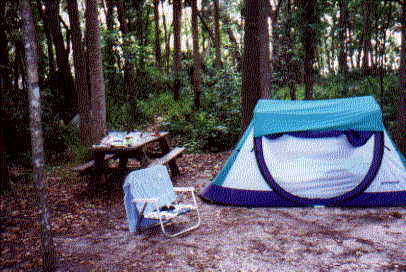 Returned that night to my campsite in the pouring rain. And an intoxicated man in the campsite across from me who kept calling out & asking if I was "sure I didn't want any company." Next day packed everything away wet. Headed toward Everglades Hostel. Oranges hung from the trees right over the tent. Squirrals were everywhere. Wow! I was REALLY in Florida! No one was in the pool. Of course, I went in. Anything above 60 degrees is warm enough for me! 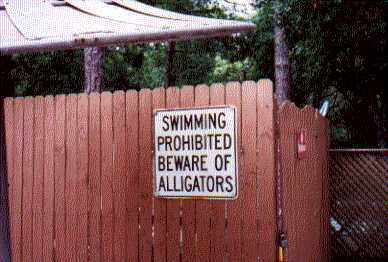 No wonder the pool was empty! After I threw all my wet camping gear into the trunk of my car I headed south towards the Everglade Hostel. The weather was warm and muggy. It started pouring buckets out. It rained so hard that I had to pull my car over to the side of the highway because I couldn't see anything. Nothing! I had to close my car windows because of the rain. It was hot! And the inside of the windows got all steamed up so I had to keep wiping them off so I could see. Maybe someday I'll get an air conditioned car, but I doubt it.